In the heart of uptown Charlotte lies a true gem. A treasure trove of pork products, savory Southern side dishes and icy cold craft beer. Queen City Q: house of “meat candy”. The restaurant is located on 6th Street in the shadow of the Spectrum Center (home of the Charlotte Hornets), which is fitting, as the original idea for QCQ was hatched over a pick-up basketball game in South Charlotte. 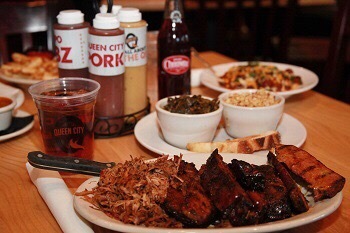 According to their website, Queen City Q was created to bring high-quality barbecue to Charlotte. I think it’s safe to say that they succeeded. Simply put, Queen City Q has the most complete barbecue menu in town. If you’ve never been (or you don’t believe me), see for yourself: here. Pulled pork, ribs, wings, smoked sausage, chicken, you name it. But out of all of their wonderful options – and don’t get me wrong, the pulled pork is no slouch – only one wears the Meat Candy crown: the beef brisket. Lovingly sliced and carefully smothered in a sweet, Lexington style sauce, the beef brisket is the unparalleled menu item that takes QCQ to the next level. I personally prefer kicking things off with a wheat beer – the Hornets Nest Hefeweizen and the Southside Weiss are both a great choices. Brewed down the street at The Olde Mecklenburg Brewery, these two beers, while on the lighter side, both punch above their weight class at 5.4% ABV. The Copper is a balanced altbier that – just like your favorite pair of blue jeans – goes well with everything. Served on tap at 38 degrees, you really can’t go wrong with any of these three OMB classics. Note: the key here is keeping it light. Trust me, the heavy stuff is coming. This is still the “pregame”. Although they are not usually a top-of-mind appetizer, the Deviled Eggs steal the show at QCQ. Topped with crispy bacon, these eggs are best when eaten with a shot of hot sauce and a slice of pickle. Now that you’ve entered the “first quarter”, it’s best to take these bad boys down in one bite – push yourself. Unlike the NBA, at Queen City it’s always important to go hard in the first half. If you’re not an egg fan, the various chips and dip options are pretty good as well. A cautionary tale: the nachos are definitely the most decadent appetizer on the menu and constitute a full meal in and of themselves. Topped with pulled pork, they’re absolutely mouth-watering, but you might be heading for the locker room after this dish alone. The Main Event. The Big Dance. The Show. “Meat Candy”. I hope you’re ready, because this might change your life forever. If you were smart / lucky enough to bring a first date to QCQ, realize that you may never be able to get rid of them after they sample this sweet bovine delicacy. Tender and appropriately sliced, the beef brisket requires only a fork and your undivided attention. Personally, I like to top mine with a little Eastern Carolina Vinegar-based sauce and a dash of the SC Mustard sauce for added kick. Pro tip: if you’re feeling really hungry (or just want an excuse to pull on some comfy sweatpants within the next hour and lovingly caress your new food baby) you can opt for the “double meat” portion, which is actually closer to 4x the beef. Aside from getting married and having children, you may look back on your first QCQ brisket experience as the most transformational life decision that you ever make. As the star of the show, the Carolina Brisket is QCQ’s Kemba Walker. All of the platter options come with two sides and if I were you, I’d make sure that one of them was the Green Bean Casserole. Topped with onion straws and melted cheese, these beans are far from healthy but hey, you don’t go to QCQ for the salads. Keep in mind that they typically run out, so if you’re stopping in for a midnight snack you might be out of luck. Frankly, side item #2 is a matter of personal preference, but you can’t go wrong with the Baked Beans, Collard Greens or Mac & Cheese. Remember, the sides are simply playing second fiddle to the brisket. They’re kind of like the Marvin Williams and Michael Kidd-Gilchrist of the plate, if you will. Pro tip: the platters already come with Hush Puppies, so be sure to explore other sides. You might also consider going with the Cole Slaw to mix in something cold with all of the other hot items on your plate. If you’re worried about getting the meat sweats, well.. just consider the slaw. If you did it right, the last thing you’ll be thinking about is dessert. Besides, you already had “meat candy”! 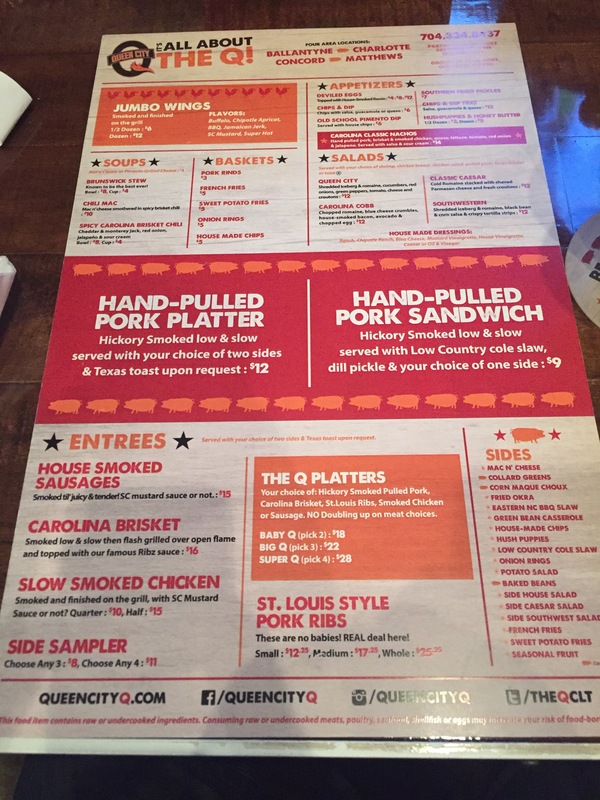 All in all, Queen City Q has the most complete barbecue menu in town. 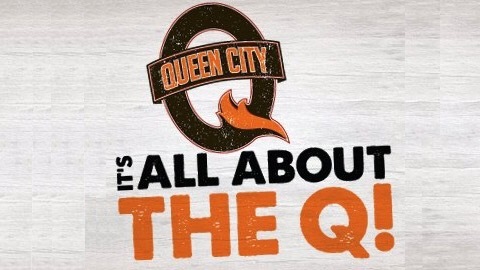 While there are other fabulous BBQ dives scattered around Charlotte, to me, Queen City Q wears the crown.